Despite a comeback in the last quarter, Trinity's basketballers lost out 61-41 to UCD Marian on Friday night in the Sports Centre. A resurgence in the fourth quarter was not enough for Trinity’s basketballers to make up for their poor shooting against University College Dublin (UCD) Marian on Friday night, as they lost 61-41 in a challenging encounter offensively for both sides. Nothing came easy for the sides in the first quarter, with neither able to find a rhythm on offence. Most plays grounded to a halt before they could lead to an open shot or a chance at the rim. 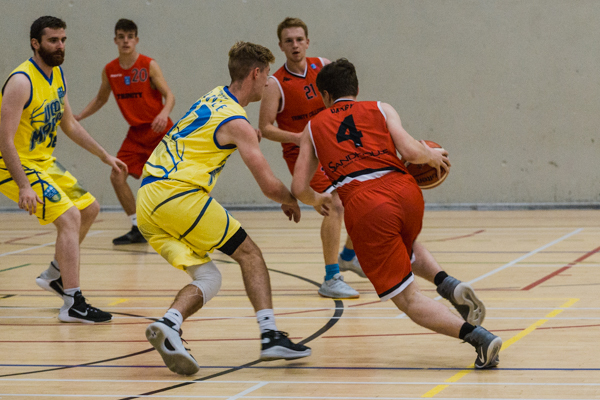 UCD’s switching on defence largely prevented Trinity from getting free lanes to drive to the rim from their pick-and-roll sets, while Trinity’s zone defence forced quick passes and tough shots for the visitors. Trinity’s first points came from a quick layup off a defensive stop, but scoring possessions would prove difficult to come by throughout the game. Marian regained their lead shortly with a layup from an offensive rebound, adding to it off a drive opened up by a quick Euro step. Trinity stayed competitive during the first quarter thanks to their high energy on the defensive end, though the visitors did gain a number of wide-open looks on the perimeter that Trinity were fortunate to see rattle off the rim. Four second-chance points courtesy of Chris Walla drew the score to 6-6 and a block from Peter Coogan with just over a minute to go ensured the teams would finish the quarter level. Trinity’s frustrations were beginning to show as their occasionally reckless passing led to turnovers late in the first. The home side’s offence finally began to pick up in the start of the second quarter, as sharp passing play between Louis Siebenaler and Johan Naslund led to an easy layup, followed by a perfectly released shot from behind the arc from Naslund to give Trinity a five-point lead. UCD were quick to respond, with long passes around the court that sought to stretch out the zone defence of their opponents, which led to some good looks. Trinity responded to Marian’s corner three with a layup from Conor O’Neill, who was unable to convert his free throw after being bumped going up to the hoop. Offensive rebounds from Marian continued to break down the Trinity defence throughout this quarter, with UCD eventually breaking out into a six-point lead on the back of a number of second-chance points. With 16.5 seconds to go in the half, UCD called a timeout for their final possession and, though the play drawn up didn’t lead to a score, Trinity were unable to box out, and Marian were able to stretch their lead with a reverse layup to make the score 25-19 going into the half. A third-quarter surge from the visitors was Trinity’s undoing, as UCD’s offence began to click and string together passes to split the home side. Manus Darby did well to cut down the deficit early on, with a superb drive finished after evading a defender in the air, but Trinity fell behind 34-23 as Marian began to get over the shooting struggles that had plagued them in the first half. Walla continued to bully the opposition in the low post, picking up offensive rebounds and ensuring that the Trinity rim was protected, but turnovers under pressure from the physical opposition ensured that UCD would go into the final quarter with a 43-27 lead. The beginning of the fourth quarter saw a complete swing in momentum, as Trinity forced turnovers on four consecutive Marian possessions. Two steals from O’Neill and another interception from Walla prevented the visitors from extending their lead, but Trinity continued to struggle on the offensive end. Layups in transition cut down the Marian lead to 11, with a magnificent chase-down block from O’Neill adding to the hysteria on the Trinity bench. A layup from Marian was followed by a three-pointer from Darby to make the score 45-34 and another score at the rim for Walla, assisted by Naslund. But Trinity’s inability to box out in crucial moments in the game prevented the comeback, as Marian got seemingly endless chances at the rim. Two free throws and an and-one play for UCD stretched their lead to 24 points, as Trinity’s ferocity on the defensive end of the court waned in the late stages of the quarter. Siebenaler continued to show great vision in transition, finding his teammates through the sea of yellow and blue, but Trinity couldn’t convert on any of these looks. The point guard added a point himself with a free throw with just a minute left in the game, but it was much too late for Trinity to have a real chance to get back into the game. The ball was dribbled out by Trinity after a score from the charity stripe for Marians.